My childhood was pretty fab. I spent most of it in Missoula, Montana-- a town where conservative rednecks and earthy liberals somehow manage to coexist (sometimes in weird dreadlocks-wearing, Ford truck-driving combinations). It was a great town to grow up in and it's always felt like home. One of my favourite things about Missoula is its strong community spirit. When I was six, the whole town united together to build a carousel. This was not one of those dinky County Fair-style merry-go-rounds. No sir. On the day of the final unveiling, babies sang and mothers wept (well, mine did least). Everything was intricate and beautiful-- from the stained glass windows to the gilded dragons and gargoyles, not to mention the horses. I remember hearing music from the band organ, which was covered by this incredible medieval scene-- hand carved knights fighting dragons in a landscape of cliffs and castles-- each of the little figures moving to the music. It truly was a moment of pure golden magic. I think special memories like this can kind of set the stage for years to come. 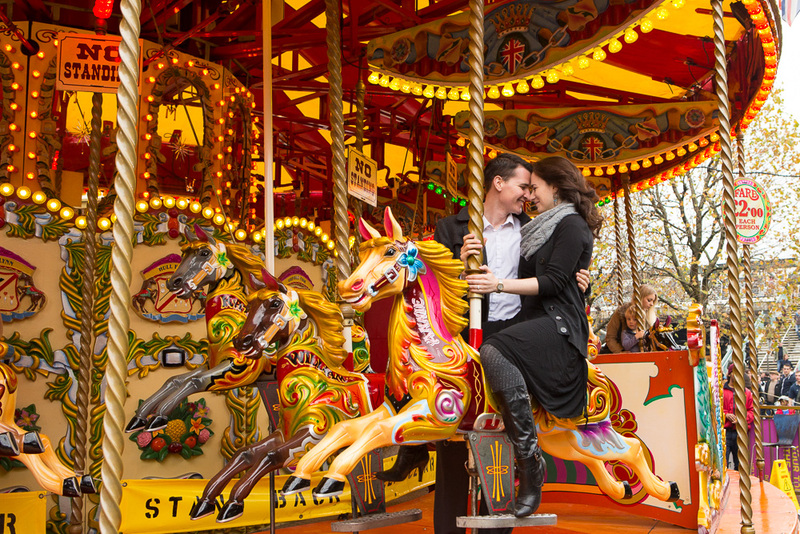 In hindsight, my life has definitely felt like a carousel ride. Up and down... round and round... Just as you're at your lowest point, somehow you take turn and suddenly you are heading to a happier, higher place. Even smaller moments are like that. Moments like when I get down about not having my own little baby to sqwunch, I feel myself heading into a descent, then suddenly I'm back at work realizing I have two dozen of the cutest, cuddliest four and five year olds you've ever seen. It's a definite high. Or when the $3000 we just had to drop on our flights back home for reunions this summer starts to make me wonder why we ever moved to London in the first place, suddenly I get an email from Ryanair telling me about flights to Prague for only £20 and life seems a whole lot brighter. So, while I sit here, nursing a glass of grape juice and getting dizzy on memories of carousels, life is feeling mighty fine. I'm lucky I have so much to be grateful for. Europeans love carousels. Some of our favourite memories recently have come with them. Check out our trip to Paris and a day at the London Christmas markets. Also be sure to subscribe so you don't miss a post!